I am an author, sports journalist, freelance writer and content writer. The very heart of my writing, the very reason that I put words on the page is to tell the big story, report the interesting facts and get the news into the public eye. If you have a story that is waiting to be told, then get in touch with a writer whose passion is to let the words do their work. Hi, I am an author, a freelance sports journalist, writer and magazine editor, with clients that range from international sports federations to local businesses. On a sports front I write for The International Hockey Federation, the Pan American Hockey Federation, Planet Hockey magazine, Hockey World News and a host of other publications and websites. From a local business perspective I count the award-winning Thornham Deli, highly respected agricultural and equine construction company Dodd & Co, exciting new businesswoman Susanna Lemon of SimplyCakes, and innovative software designers Pursuit Software among my local business clients. It's a diverse portfolio – but at the core of my work is a love of telling the whole story. Whether it is a heart-warming and inspirational story about hockey development in the third world or news that a local food producer has won a national award, if it is worth telling, then it is worth writing. My work ranges from website content, blogs and articles that showcase the client's own talents, to articles in newspaper and magazines that tell a story, highlight a success or breaks new ground. The challenge of my work is to produce fresh, interesting and attention-grabbing stories while maintaining high standards of writing and editing. The two latest additions to my portfolio have been two ends of the media spectrum. 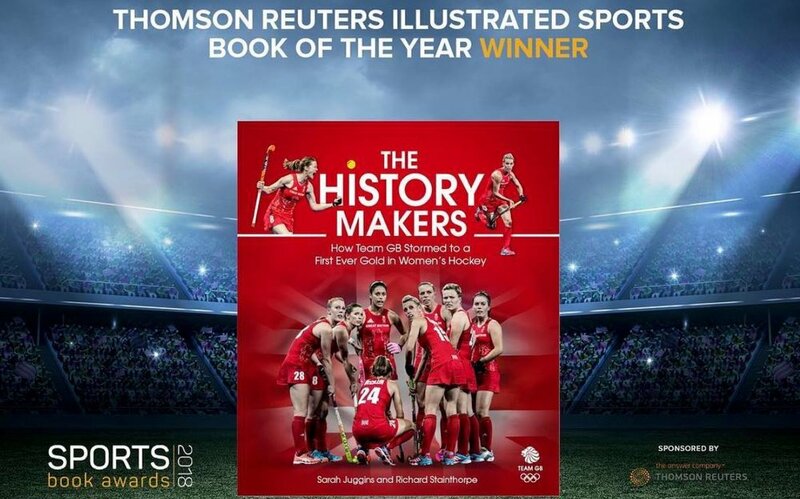 Short, snappy videos, mainly from the world of hockey, give an instantaneous snap-shot of an event; while the long view has resulted in a fourth book - The History Makers, a celebration of the night in Rio 2016 when GB women's hockey team won a gold medal in a match that was voted 'The moment of the Olympic Games". A book signing in the Norwich store Jarrold's is a nice way for this particular adventure to come to a conclusion. When Pitch Publishing agreed that the Great Britain women's hockey team winning gold medal at the Rio 2016 Olympics was worthy of becoming a book, I was both thrilled and apprehensive. Myself and my co-author Richard Stainthorpe were thrilled with both the finished product and its reception. The book was five months in the writing and a further two months in production. The book came out on 1st September and is available in WH Smiths, Waterstones and all good bookshops, as well as online through Amazon. It has already entered its second print run, so the two authors are delighted. Three books published in one year was more than my wildest dreams could have imagined. All non fiction, my first publication was an exercise book aimed at the 8-11 year-old child. Called Fit Kids, it is a book that suggests just a few minutes of exercise a day can help counter the modern health issues of obesity and its associated illnesses. The book is packed with advice for parents and teachers on how to introduce exercise into a child's life as well as an exercise chart that gives practical solutions. Book Two is a walking book. Entitled Walks for All Ages: Norfolk, the book contains 20 4-6 mile walks that anyone, of any age, could do. The book also contains a brief history of the area covered in the walk, as well as a ordnance survey map of the route. My third offering of the year was a book on the restaurants, chefs and producers that are making such a success story of the Norfolk food scene. Norfolk Table: One County, Twenty Chefs, contains recipes and the background to some of Norfolk's best eating places. It is also an extremely visual book, with some great photographs. This book was a collaboration between myself and the partners behind Feast Publishing. My position within the world of sport is firmly rooted in hockey. I am editor of the bi-monthly global hockey magazine, Planet Hockey; I write for the International Hockey Federation, the Pan-American Hockey Federation and England Hockey. I have also started regularly contributing to the newest title on the newspaper stand The Hockey Paper. Away from the hockey pitch, I have an absolute enthusiasm and passion for local businesses who are working hard to be the best they can. I provide a writing service for those businesses who know they need to market themselves but are too busy being amazing at what they do. Food producers, agricultural services, boutique accommodation, IT specialists, health centres – all doing amazing things, all deserve their story to be told. The quality of writing that I hope to bring to any writing assignment is matched by the enthusiasm I have for each and every topic. For me, everyone’s story deserves to be told in the most compelling and animated way. I like to think my three main qualities are: high quality writing, always hitting deadlines and my ability to understand and get across every client's point of view. I moved back to Norfolk three years ago and since then I have thrown myself into local life. I write a column for the local paper The Lynn News; my articles appear frequently in Suffolk/Norfolk Life, KL Magazine and Norfolk On My Mind; and I also run a stall at Creake Abbey Farmers Market, selling local charcuterie. Keeping up to date with social media is something that companies are realising they must do, but often lack the resources – time or specialist knowledge – to do effectively. As a writer, I am adept at getting your message out into public eye, whether through Twitter, Facebook, Instagram or blogs from your own website. My ability to make the words tell the story is a powerful tool and one that many local businesses are already using. Sparkling copy, a nose for what makes a good story and an in-depth knowledge of how to get the news out and about are all areas that I can work with businesses to develop. Sarah is a talented writer who can create compelling content covering a range of subjects. Sarah worked full-time for CPL for three years and we have continued to hire her regularly on a freelance basis since then. Should farmers open their footpaths to the public?